The purpose of this essay is to interrogate the relationship between the principles of The New Deal and Frank Capra’s It’s a Wonderful Life (1946). The New Deal introduced extensive welfare programs, safety nets and stimulus spending that brought the United States out of depression and into a period of economic boom. Frank Capra largely shared these values, as evidenced by the term ‘Capraesque’: ‘Capraesque therefore encapsulated a belief in the underdog, a spirit of unshakeable optimism, a commitment to love thy neighbour, all firmly grounded in American history and American folklore’ (p. 71, Rawitsch 2014). This belief in the underdog is mirrored by the New Deal’s concern for working people and its distrust of corruption and monopolies. 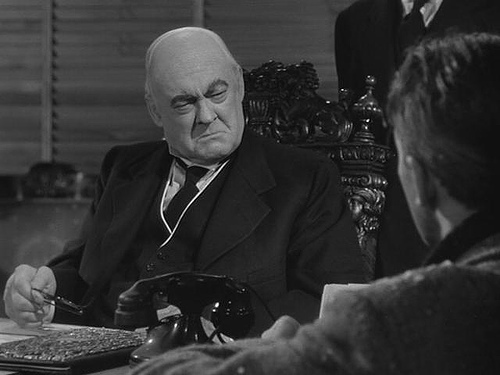 The character George Bailey triumphs against all the odds and the predatory banker Potter often tries to ruin him. This belief in community and American history is also shared by the New Deal, which was patriotic and wanted to redistribute wealth to preserve social cohesion. This essay will look at the New Deal’s welfare programs and will provide some background on the Keynesian economics that shaped it. It will look at how these welfare programs, such as ‘Building and Loans,’ are recreated in institutions in Capra’s film. It will examine how the ethics of this institution mirror those espoused by the New Deal and it will examine how they clash with the ethics that preceded laissez-faire, which are held by the banker Potter. Two aspects of the New Deal which were more sinister and populist were redistribution and its characterisation of bankers. This essay will look at how the film deals with this and will try to gauge whether this rhetoric is presented benevolently or maliciously. Finally, this essay will look at equality of opportunity in the film, as the New Deal created unheralded opportunities for large sections of the population. This essay will start by outlining some central principles of the New Deal. Poverty and unemployment were rampant in the USA after the great depression in 1929 (Zentrer 2011). The central aim of the New Deal was to use the federal government to intervene in the economy and combat depression. A quarter of a million people were unemployed and A ‘New Bill of Economic Rights’ was drafted to guarantee welfare for every American (Zentrer). Its aim was universalist and it meant that the program required ‘a transformation of the very principles of American government’ (Zentrer). It was an affront to America’s laissez-faire heritage. The New Deal assured ‘guarantees to life, liberty and property’ and every citizen could turn to the central government for job security and retirement insurance. Additionally, the New Deal wanted to regulate private enterprise and to stabilise the banking system (Zentrer). The state was seen as a benevolent entity that could generate prosperity and address social injustice. Central government would actively involve itself in the private lives of Americans. Americans prior to this thought that public money should only be spent on programs such as national defence. Public spending under Franklin D. Roosevelt doubled. Government would now be centralised, not federalised. The aim of national government would be ‘the continual expansion of the national economy and the more equitable distribution of wealth within that economy’ (Zentrer). Three principles that emerge in the new deal include full employment, fairness and economic growth. The Roosevelt administration invested in extensive welfare programs to address this. This essay will now examine the centrality of welfare to the New Deal. These programs helped people back into work, provided a safety net that protected citizens from destitution and brought the economy out of a depression and into a period of high productivity. Programs such as ‘Civilian Conservation Corps’ and ‘Work Progress Administration’ helped workers back to work (Zentrer). Government socialised insurance programs, which had previously been private. The principle of insurance was to minimise economic risks that individuals might encounter. An individual pays money into a fund that accrues over time in private insurance. Meanwhile, individual tax payers contribute to a fund managed by the government in socialised insurance. These funds in either case are later used to provide income for those unable to support themselves through labour (DeWitt 2010). This need for public provision according to DeWitt, arose after the emergence of industrial societies. There was an emerging need for social insurance, as larger swathes of the population needed security. Additionally, only 10% of elderly people were insured and this demographic was particularly hard-hit by the depression. 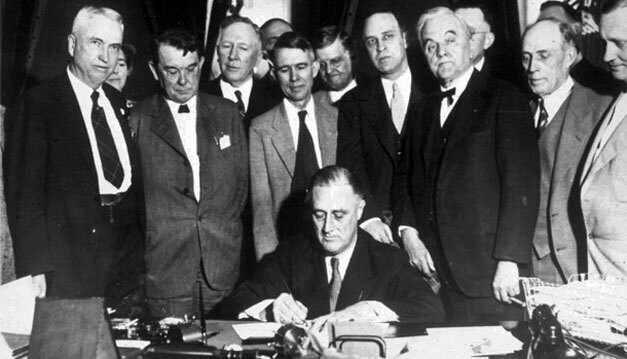 Additionally, the New Deal pushed through bank reform. Before the Great Depression, many banks ran into trouble. Finance was a new sector of the economy and bankers took risks in the stock market (Moffatt 2017). Bankers often provided unethical loans to sectors of the industry that they partially owned. An ‘Emergency Banking Act’ was instituted, which reopened banks with federal loans and treasury oversight (Moffatt). Banking, insurance and security businesses were banned from mixing with one another. The government created its own banking sector called ‘Savings and Loans’ after the war, which helped citizens find mortgages (Moffatt). Banking became a more co-operative affair, a social service for the common good. The institution in Capra’s film, ‘Building and Loans,’ is clearly modelled on it. The Great Depression, according to DeWitt, was not the real reason for all of these welfare programs, but it was ‘the triggering event’ (2010). There were two periods when The New Deal where the aforementioned programs really came to effect. The ‘first New Deal’ (1933-34) was seen as a period ‘of relief and recovery’ following the Great Depression. 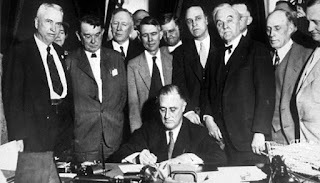 The ‘Second New Deal’ (1935-37) was the period where the Roosevelt government sought to implement ‘long-lasting changes,’ which included the passing of the Social Security Act. The Social Security Act provided old-age assistance, old-age benefits, unemployed insurance, aid to dependent children, grants for maternal and child welfare, public health programs and aid to the blind. The Federal Reserve funded all of these programs (DeWitt). The aim of these benefits were to to be generous enough to provide economic security for all citizens. They were also designed to be equitable, meaning that the benefits should be inversely proportional to the amount each recipient pays for them. Most systems prioritise one or the other, however the Social Security Act sought to reach a balance between both (DeWitt). At the time of the release of It’s a Wonderful Life, tax rates had been frozen due to the war. However, revenues for such programs were higher during this period due to war-time full employment (DeWitt). The economic backbone to the New Deal was formulated by John Maynard Keynes. This essay will now briefly explore some of his ideas. ‘Laissez-faire,’ meaning transactions free from government intervention, had been discredited. The unfettered free market was believed to be ‘a unique point in history’ (p. 27, Skidelsky 2010). The First World War had brought about financial disorganisation and the Versailles Treaty worsened the peacemaking process. Less goods were bought and there was less investment (p. 27). The UK – Keynes’ birthplace – had returned to the gold standard under chancellor Winston Churchill to artificially raise interest rates. This overvalued sterling and led to a fall in the cost of production, which led to a low-employment economy (p. 58). Demand fell short of supply – otherwise known as ‘overproduction’ - and output eventually stalled. Keynes urged governments to invest in the economy to artificially boost demand and inflate the supply of money, which would lead to a full employment economy (p. 96). These theories were also the theoretic backbone to the New Deal, which strove to create demand, stimulate the economy and drag it out of depression. High interest rates and modest inflation were to be tolerated if it led to full employment and high productivity. There is a clear frustration from the banker about the strict controls which have been levied on banks. Before bank reform, Potter would have been free to invest in whichever way he liked. The bank reforms also forbid banks from mixing with insurance and security companies. Potter resents this, as they eat into his revenues. George’s assistant says: ‘That’s fine coming from you, considering that you brought him into his grave.’ It becomes clear in these scenes that Potter has unethical motives. Later in the film, we find that he steals their funds. It becomes apparent that he wants to derail the institution so that he can concentrate wealth to himself and let the rest of the town dwindle. It becomes apparent that he mistrusts social programs that help the poor find mortgages and provide them with a safety net. He says that Potter was a man with ‘high ideals,’ which implies that the ideals underlying some of the programs of the New Deal are naive. Institutions such as Building and Loans, according to Potterm disincentivise individuals. Potter also mistrusts Building and Loans because it is a competitor and he wants to monopolise the market. As this essay will later explore, Roosevelt and the New Deal wanted to break up the ‘concentrated wealth’ that arose as a result of such monopolies. Potter couches his language in the rhetoric of laissez-faire, as he argues that these programs disincentivise individuals. However, it becomes apparent that Potter mistrusts Building and Loans and banking reform because he is unable to invest unethically, monopolise the mortgage industry and accrue all wealth entirely for himself. This essay will continue to make further examinations about the clash between the ethical values of Building and Loans and Potter. This paragraph will examine how Building and Loans and Potter value distribution of wealth. Building and Loans is a co-operative. Its funds are built up from its contributors and they are later redistributed. Everyone provides for each other’s safety. Peter Bailey finds this ludicrous and states that it is comprised of ‘starry-eyed dreamers.’ Furthermore, he states: ‘What does that do for us? A discontented lazy rabble instead of a thrifty working class.’ The New Deal indubitably poured money into the economy to boost demand and helped people back to work through generous welfare packages. These are the effects it had. However, the banker sees social security, the safety net and welfare as programs that make workers lazier and that do not incentivise them to work and compete. This is despite the recent legacy of deflationary laissez-faire that led to economic ruin, unemployment and poverty. The banker also mentions the word ‘thrifty,’ which suggests that they should save more and be more disciplined with their finances. Wealth should not be redistributed to them so that they can own their own home. This is despite the fact that the banker has inordinate wealth and his consumption is excessive, as evidenced by his dapper clothing and his fondness for cigars. George Bailey retorts by giving an impassioned speech. He states that his company helps people get of ‘your [Potter’s] slums’ and that even though his father was ‘no businessman,’ before people had to ‘wait and save before they had a decent home.’ He highlights how wealth is unevenly distributed, since the workers account for the majority of the labour force. It makes little sense for all their labour to be monetised and transferred to a single individual: ‘They do most of the working and paying and living in this community. It is not too much to let them die in a couple of decent rooms and a bath.’ There is a strong sense of social justice here, as there is a definite desire to help the less fortunate through a safety net. George Bailey and Building and Loans want their co-operative to help, support and incentivse people. They also want wealth to be distributed across the entire community, not a single individual. Potter, on the other hand, distrusts these co-operative values and want the revenues of their labour entirely for himself. This essay will try to look at how the formal aspects in this scene – namely camera work and mise-en-scene – contribute to the thematic aspects outlined above. There are several suggestions in the mise-en-scene that Building and Loans is a communal institution. When we see a mid-shot of the board discussing the future of the company, we can see a framed photograph of George’s father in the background (27.29). This highlights the centrality of family to the institution and George’s desire to stay true to his father’s principles. Alongside this portrait, there is a small replica of a house on top of some drawers. This once more reifies the values of the company, as housing is obviously as central as family and community. Throughout the building, there are many other signs which emphasise the charitable ethos of the company. ‘Build your own home’ is emblazoned in glass. There is also a framed caption: ‘All that you can take with you is that which you’ve given away.’ The former emphasises how the company bequeaths its customers with new opportunities. The latter sign emphasises the co-operative nature of the company. In other words, all its contributors contribute to the company and help all the other contributors. This emphasises the communitarian ethos of the company and how all the members of the community care for each other in both a pecuniary and emotional sense. The values of the company – family, community and housing – are all subtly recreated via the mise-en-scene. However ‘ugly’ the language of redistribution might appear, it is seen as benevolent in Capra’s film. Money is taken from wealthier people and is transferred to the less fortunate. The film sees this as noble and often satirises the upper crust. Taking cash payments from Potter is never seen as ‘ugly’ and revenue for the company is often raised by wealthier members of the co-operative. The institution continually defies all the odds and manages to stay in business. Wealth in this community is shared and the film sees nothing sinister about it. George Potter sums this ethos succinctly: ‘Our money isn’t in a safe. Your money is in Joe’s house, next to yours and in Kennedy’s house and a hundred others.’ The use of camera angles and the framing of bodies also manages to recreate this ethos. The members of the institution are distressed because the institution is about to be liquidated. We always see the members and George portrayed via close-ups. We later see them trying to solve the problem via a mid-shot. Close-ups usually portray single individuals whereas mid-shots usually a cover a wider depth of field. Close-up shots are often in cinema to uncover subjective states (Carter 2011). There is enough space within a mid-shot to frame a whole group of individuals. We only hear the individuals protesting about the problem in the close-up shots. We only find George and the members coming to a solution when they are all portrayed via the mid-shot. Although their situation is difficult, they do not complain and they appease one another. Redistribution in this case creates social harmony and it does not create fissures. The use of mid-shots also evince this ethos of redistribution.
. As this essay stated, the New Deal had a populist streak and this comes through most clearly in its vilification of bankers. The banker Potter is frequently vilified throughout the film and the film portrays the stereotype as a whole in a satirical manner. Potter even bears a resemblance to this stereotype, as he often smokes a cigar and wears ostentatious clothing. Although the film has a gentle and a heart-warming message, George’s father is unusually mordant when he refers to Potter: ‘He is sick in his mind, sick in his soul. There isn’t anything that he won’t get his hands on’ (14.20). Like redistribution, this populist language is also potentially sinister as it singles members of society and blames societal woes on it. Building and Loans is modelled on a New Deal program and the banker always tries to close it down. The controls placed on banks frustrate him as they thwart his unethical investments. The new regulatory controls forbid him with mixing with insurance and mortgages. He wants to monopolise the market and concentrate wealth entirely to himself and tries to derail the company unethically by stealing their funds. Whenever we see the banker, he is always portrayed in a satirical manner by Capra. We often see him lit in darker tones. During the meeting with Building and Loans’ board, the banker is often darkly lit whereas the photograph of Peter Bailey is brightly lit. He also wears black clothing whereas the rest of the board wear lighter clothing. Chiaroscuros is used in this scene – I.e contrast between dark and shade in a black and white photograph. There is more light in the board’s side of the table whilst there is more shade in the banker’s side of the table. He sits in a coronet chair and he is surrounded by busts, lavish book cases and a chandelier in his office. He is surrounded by sycophantic assistants in both scenes. Finally, this essay will examine social mobility, which was one of the New Deal’s most notable achievements. One of the principles of the New Deal was to help upward mobility and economic opportunity. This was enhanced with Lyndon B. Johnson in the 1960s and his ‘war on poverty.’ (Woods 2016). The 1950s were not only a period were government actively assisted the poor and tackled social justice, it was also a period where there was more upward mobility (Woods). America’s history of small government and individual rights might make the New Deal appear ‘UnAmerican,’. However, it was often couched in American rhetoric. The exceptionalist idea that America was ‘a land of opportunity,’ according to Timothy Noah, ‘rang true’ during the New Deal (2012). The economy boomed and people who were born during the Great Depression enjoyed greater opportunities. 85% of unskilled workers moved up to semi-skilled labour, skilled labour or higher positions (Noah). Indeed, there was more upward mobility during the 1950s and 60s than any other point in American history (Noah). Although these opportunities existed at the time, George Bailey defies them and stays in his town to work for Building and Loan. This essay will now analyse two scenes which analyse this decision and the booming new opportunities. It will also analyse who benefits from this upward mobility and who does not. In one scene we meet George discussing his future with his father. George wants to pursue these new opportunities, however his father wants him to stay at Building and Loan: ‘I want to design things, plan modern buildings’ (14.20). These unheralded opportunities promise riches and dreams of self-realisation. However, the New Deal was also a paternalistic movement that promised to use big government to care for its citizens. In this scene, George decides to make an ethical decision and stay at Building and Loans, even if he remains rooted in the same economic and social class. Geoge claims that he wants to ‘do something big and important’ and ‘not stay the rest of my life in a shabby little office.’ However, his father retorts: ‘I feel that we are doing something important. […] helping people buy homes in that shabby little office.’ There is a sense that this paternalistic institution is more ethical than big business. George makes it clear that he thinks that his father’s company is virtuous: ‘I think that you are a great guy.’ Staying in the same community and contributing to that community is seen as more virtuous than pursuing new opportunities, wealth and upward mobility. This largely contravenes the ‘land of opportunity’ cliché integral to Hollywood, as Hollywood often champions clichés such as self-realisation (Gant 2006). Capra’s film, by contrast, champions a quainter cliché. It champions community and family bonds. This scene also reveals how some demographics and classes were not privy to these booming opportunities. The New Deal has subsequently been criticised for not offering opportunities to blacks (Powell 2003). It was only until Lyndon B. Johnson’s government that they started to acquire more rights when he passed the ‘Civil Rights Act’ (Bowen 2015). In this scene, we find that it is a given that their black maid will always stay working with them. It is a given that she will remain rooted in the same economic class: ‘I’m going to miss Annie.’ Although the New Deal had paternalistic principles, it ended up enabling unbridled new opportunities. Athough George is offered several opportunities, he chooses the ethical choice and retains these principles. This contravenes the ‘land of opportunity’ cliché often promoted by Hollwood. And although several characters have these opportunities, blacks do not have the same rights. This essay will now gauge how these issues are recreated through the use of camera angles and the mise-en-scene in this scene. The father’s house is quaint and reveals how he has remained rooted in the same social class. The overhead lamp has tassels and the table is copiously filled with plates and food. There are framed photographs of butterflies, which reveals that his father has a specialised interest. There are several clocks adorning the house, including a pendulum clock. All these aspects create strong sense of roots. The New Deal coincided with economic changes and this, combined with Keynesian stimulus spending, contributed to economic growth. His father’s house already looks anachronistic and this reifies the social, economic and technological changes that have occurred in their lifetimes. The camera framing often emphasises this disparity. We usually see George’s father speak via ninety degree mid-shot, which gives ample room in the frame to reveal his quaint interest in clocks and butterflies. We usually see George via a high-angle mid-shot. The white wallpaper makes these objects come to prominence. Peter wears a quaint white jumper and whilst George wears a dapper suit. The editing alternates between these two shots and they emphasise the generational differences between the two characters. Editing in Classical Hollywood often followed strict cause-and-effect logic (Bordwell, Staiger, Thompson 2010) and this is in evidence in this scene. There is also another scene where these unbridled opportunities become starkly apparent. One of George’s school friends becomes considerably wealthy as a property magnate and has reaped the benefits that the New Deal generated. In a scene where George meets his future wife, he offers him the opportunity to join him and thereby mobilise upwards. George rejects this offer and chooses to marry his wife and stay at the Building and Loan. He prioritises the ethos of his company and wedded bliss over this extravagant opportunity. His friend tells him that ‘it is the chance of a lifetime […] Put every cent of stock into this, that is unless you are married to that broken down Building and Loan.’ At one point, his friend asks him to move to Rochester and George replies ‘Rochester? Why not here?’ As this essay established, industrial, economic and technological changes meant that thousands of people moved away from rural towns and into the city. His friend also says at one point that ‘it is the biggest thing since radio,’ which emphasises the technological nature of the job. It is clearly innovative, transformative and entrepreneurial. It is at this point that he kisses his wife and chooses to marry her. There is clearly an ethical dimension to this stance which indicates his interest in social justice. However, his desire not to be upwardly mobile and not to make extravagant riches is also borne out of his desire to have a stable family and community. This outlook has a conservative slant. This creates a stark binary choice and this is recreated through the use of lighting. This scene is more brightly lit than any other in the film. Geoge wears brown and his wife wears black, however the darkest tone in the frame is the black telephone, which carries the message about the job opportunity. The mise-en-scene is sparse which enhances the bodies in the frame. The close-up is zoomed very closely into the two individuals and the bodies take up most of the space in the frame. Two individuals are squeezed very tightly into the frame and the only other object in view is the black telephone. This highlights the binary choice he has to make and how he chooses the most ethical choice over these extravagant opportunities. These are the two scenes where equality of opportunity are recreated. Building and Loans is modelled on the New Deal program Saving and Loans. Its outlook is lauded by Capra, as it protects the little man from the predatory of interest of bankers like Potter. These social institutions create social harmony and new economic opportunities and welfare programs are seen as a genuine safety net which help the vulnerable. The institution is a co-operative and the whole community contributes to it so as to help each other. This is recreated by the use of mid-shots whereas the use of mid-shots recreate individuals. All of these qualities are seen as American and the preceding laissez-faire economic system, symbolised most appositely by the banker Potter, is seen as inimical to the country’s values. He appears to be an unethical character who wants to monopolise his market and drive the revenue of the community’s labour directly to himself. The film also deals with two aspects of the New Deal which could be seen as being more sinister, such as redistribution and negative characterisation of bankers. Redistribution is seen benevolently, as it creates social harmony. Bankers are satirised and are also seen as a menace to social harmony and personal freedoms, which also reifies New Deal propaganda. ‘Land of opportunity’ is an American cliché that recurs in several Hollywood films. Capra’s film prefers the quainter cliché of loyalty to family and community. The New Deal created new opportunities for large swathes of the population that had disenfranchised. However, the central character George chooses to remain loyal to his community and thus chooses the just option. These are all the aspects about the New Deal which this essay has identified. Carter, Erica. (2011) Bela Balazs: Early Film Theory. Oxford: Berghahn Books. Gant, Mike-Choopa. (2006) Hollywood Genres and Post-War America. London: I. R. Tauris. Skidelski, Robert. (2010) Keynes: A Very Short Introduction. London: Oxford. 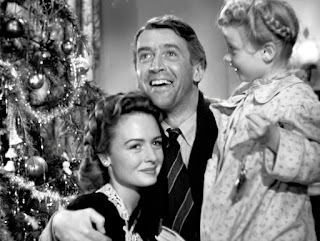 Capra, Frank (1946) It's a Wonderful Life. RKO Radio Pictures.